We say that a lot around here. The Ocracoke community is quick with a fundraiser, a fish fry, a collection to help our neighbors in need. This time is no exception as Ocracoke rallies around one of its favorite pirates. Jessica Caldwell and Chris Gaskill are bringing back Island Trivia at Gaffer's Sports Pub on Monday, June 19th for a fundraiser for Derek Rogers-Gilliam. Derek sustained a serious cervical spinal injury on June 12th while swimming in the ocean on Ocracoke, and was air lifted to a trauma center in Greenville, NC. Recovery will likely be a long road, and Callie and Derek's family are by his side at the hospital. Come out to support them and have some fun! Trivia is a winter activity on Ocracoke, so this is a summer exception for a great cause. The trivia contest costs just $2 each to play (in teams of up to 4 people), but additional donations are welcome. The games begin at 7pm! 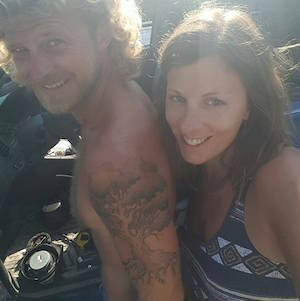 If you'd like to make an online donation to support Derek and Callie, please check out this GoFundMe campaign set up by Ocracoke resident Marissa Gross. 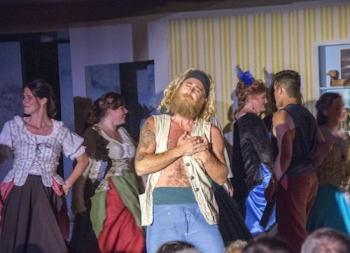 Derek during his piratical solo in "A Tale of Blackbeard"
You can also make a donation to the Ocracoke United Methodist Church with Derek's name on the memo line, and 100% of the donation will go to Derek and Callie. Stop by the church or mail a check to PO Box 278, Ocracoke, NC 27960. Callie asked us to please express their love and gratitude to the island. On Monday afternoon, she posted an update that Derek "is still in ICU, but he's proceeding. We are currently looking into spinal rehabilitation facilities." She says she's deeply grateful for everyone's support, hope, and love.